Invasive species are organisms that are introduced into a non-native ecosystem and which cause, or are likely to cause, harm to the economy, environment or human health. Recently non-native Asian tiger shrimp have been spotted off the U.S. Atlantic and Gulf of Mexico coasts. Governmental scientists are working diligently to understand the reason for the increase and the possible consequences for native marine animals in those waters. The non-native shrimp species could have escaped from aquaculture facilities, transported from ships or floating in ocean currents from wild populations in the Caribbean or other locations. These crustaceans can measure up to 13 inches long and weigh nearly a pound, with dark and white stripes circling their bodies. They can be very disruptive to the Gulf's ecosystem, says James Morris, a marine ecologist with the National Oceanic and Atmospheric Administration's Center for Coastal Fisheries and Habitat Research in Beaufort, N.C.
Like most other shrimp, the jumbo prawns are cannibalistic (to eat other animals), Morris says, and because of their size, they can gobble up many of their smaller Gulf cousins and their larvae. They compete for the native shrimp's food supply and spread through their environs, disrupting the eco-balance. Tiger shrimp spawn between 50,000 and 1 million eggs a cycle, he says. Testing will determine whether the tiger shrimp are in the early stages of a population boom. Tiger shrimp caught off the coast of Dauphin Island, Alabama on Oct 2, 2012. © 2012 Maravilloso Magazine. All Rights Reserved. 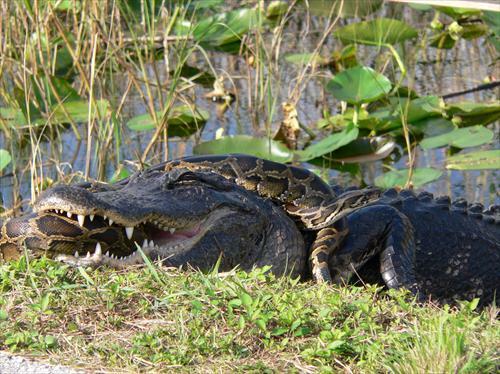 According to the U.S. Geological Survey, mid-sized mammals in Everglades National Park are getting a big squeeze from invasive Burmese pythons, according to a USGS co-authored study published in the Proceedings of the National Academy of Sciences. These pythons, large constricting snakes native to Asia that can reach more than 20 feet in length and upwards of 200 pounds, are now found throughout much of southern Florida, including all of Everglades National Park. Since the recognition 11 years ago that these invasive, exotic snakes were breeding in the park, formerly common mammals there have declined dramatically. serve as potential hosts for parasites and diseases of economic and human health significance. As a result, Burmese pythons pose considerable challenges for the ecosystems of South Florida and many of the animals that live there, including threated and endangered species. Federal and state agencies or institutions are working hard to deal with the serious threats caused by this invasive species. USGS research aims to help managers preserve and restore the Everglades’ ecosystems. Do not keep wild animals as pets. These animals are made for the wild. They will get too large for your home. If you have a wild animal that you can no longer keep, DO NOT RELEASE IT TO THE WILD. Call your local environmental center, zoo or U.S. Geological Survey. If you find a wild animal/non-native species, report the date, time and location of the animal. DO NOT ATTEMPT TO CAPTURE IT, YOU ARE NOT A PROFESSIONAL.